Increasingly, pharma and biotech companies are recognizing the critical role that reimbursement and access play in today's evolving healthcare landscape. Recently, a large biotech company deployed training using our simulation platform to improve their commercial teams' knowledge, skills and behaviors in these areas. They also measured the factors that lead to optimal performance. Specifically, reps were able to practice reimbursement and access problem solving, engage in dialogue, and identify the appropriate company programs to help address the issues they uncovered. Through the decisions made in the simulation, optimal behaviors were measured across four key metrics: engagement; efficiency; total office call; and use of resources. Reps are placed in real-life scenarios and the storyline unfolds based on their decisions. As they progress through the simulation, data are captured on their decisions and behaviors. These data are used to help reps better understand the effect of their decisions on outcomes. At the end of the activity, reps were given a results-based report highlighting their decisions in comparison to their peers, with results-based coaching feedback for each decision. The Learning & Development organization had immediate access via online dashboards to the aggregate data for each key decision and behavior in each simulation. Summary data were made available to field management to assist with their field coaching efforts. Through this program, reps were able to identify ways in which they could improve their performance and practice optimal behaviors. The L&D organization was able to identify unmet needs to further improve the program. Field management was able to target their coaching more effectively. 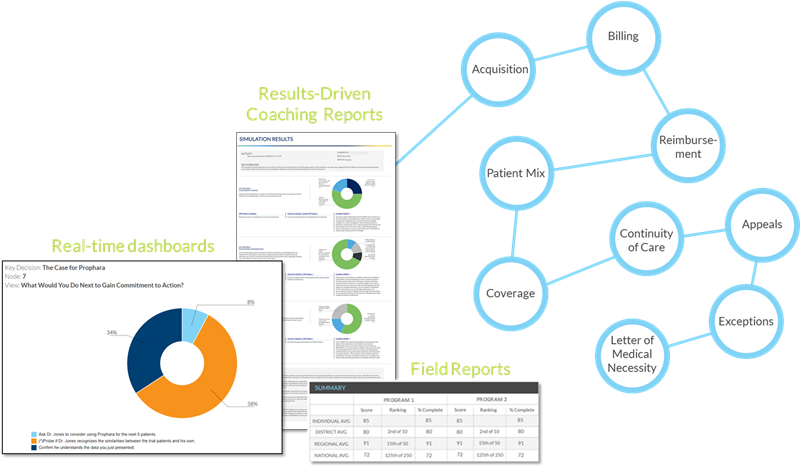 The Kynectiv simulation platform helped improve outcomes and provided actionable insights.